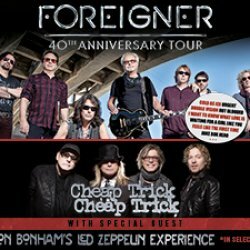 Rocker Mick Jones reunited onstage with his original Foreigner bandmates Lou Gramm, Al Greenwood, and Ian McDonald for the first time in almost 40 years on Thursday (July 20). Jones welcomed his old pals back into the fold at the band's show in Wantagh, New York, with Gramm once again taking on lead vocals 14 years after quitting the line-up. The reunited stars, who last shared the stage together in 1980, performed renditions of Long, Long Way From Home, I Want to Know What Love Is, and Hot Blooded, much to the fans' delight. "It was great to have Lou, Al and Ian join us on stage last night, and certainly brought back some special memories," Mick shared in a statement issued on Friday (July 21). Drummer Dennis Elliott was the only surviving original member missing from the show, but Mick hopes to get everyone together next year, if the band is inducted into the Rock and Roll Hall of Fame. The statement continued, "All the original guys are out there playing live shows and working on studio projects. A performance by the entire original band for a Rock And Roll Hall Of Fame induction next year would be a great way to cap off our 40th anniversary celebrations." Foreigner released their self-titled debut album in 1977. Jones last performed with Gramm at their induction into the Songwriters Hall of Fame in 2013, but earlier this year, the guitarist revealed it was the "right time" to get his pals back onstage with him for their 40th anniversary tour with Cheap Trick and Jason Bonham's Led Zeppelin Experience. It's not yet known if Gramm, Greenwood, and McDonald will all be back for more performances on the trek, which kicked off earlier this month and runs until September.